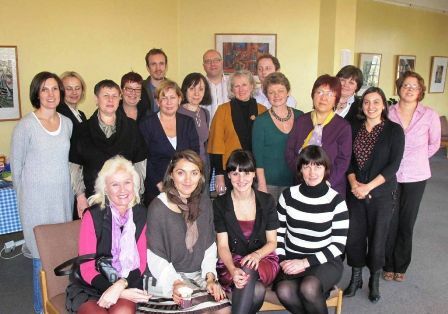 Welcome to the Russian Teachers' Group, a UK organisation that hosts training events for teachers of Russian, provides resources, and advertises Russian events that happen in the UK. Membership to the RTG is completely free. If you join, you will have access to our database of resources (over 500 files), free updates about RTG events, job positions and cultural events. The RTG committee's decision to make membership free will allow easier and cheaper access to resources and information. If you would like to join the RTG, or would like to have your company or event advertised on our site, then contact us via our contact page. When doing so, make the subject "Joining the RTG", and remember to put your first and last names in the body of the e-mail. As the RTG is run by full-time teachers, please understand that it may take up to 4 working days to reply to your messages, or to get access to the resources. Дорогие друзья - we are looking forward to seeing you on Sunday 17th March! The event is almost full and we are therefore not able to take any further payments. The RTG Committee is delighted to announce the winners of the 2018 National Russian Essay Competition. Prizes will be posted to the winners' schools. Congratulations to our winners below! The RTG Annual March Meet was held at Rossotrudnichestvo on the 4th of March 2018. This year more than 50 teachers from accross the UK attended what proved to be an exciting and inspiring day for all. The programme included many practical sessions from teaching grammar to incorporating new trends in IT into your Russian classroom. All lead by truly inspirational and experienced teachers. The National Essay Competition has been launched. Good luck to all those who sent their entries. The judges will be reviewing them in the next few weeks. This RTG seminar became a great platform for the Russian Teachers across the UK to share their good practice and look at the new A level and GCSE specifications. Read more here http://gbr.rs.gov.ru/ru/news/21762. They've been writing about us over at Rossotrudnichestvo!